Miko Peled was born in Jersusalem into a well known and influential Israeli Zionist family. His father was a famous General in the Israeli Army, of which Miko also served his time. When Miko's niece was killed by Palestinian suicide bombers, you may have expected the family's emotions to be directed at the Palestinians, but surprisingly they blamed the state of Israel, and their brutal torturing and persecution for driving people to such despair that they would take their own lives. Through his father's intimate knowledge of the Israeli war of terror, coupled with his own research, Miko Peled shatters the myths surrounding the Israel and Palestine situation, and delivers a truth so damning that many Jews and Israel supporters will not be able to handle it. He exposes facts such as the original expelled Jews are not the ones coming back, and they are not their descendants either, covers the double standards regarding the right of return, which doesn't apply to Palestinians, and dispels the myth that there has been a conflict for ages by producing proof that it was peaceful up until 1947 when Israel launched their illegal attacks. Miko is just one of a number of modern day Jews against Zionism and the state of Israel, and with the information he delivers in this brilliant talk, its not hard to see why more and more Jews are rejecting Zionism and calling for the dismantling of Israel. It is a true eye-opener for anyone who has for too long been blinded by the lies and misinformation given by the mainstream media, and the facts come straight from the heartland where he has spent many years documenting the true story. BE: Yes. We didn't touch anything, we didn't touch anything. You should know that – also in Lod, we didn't touch a thing. We had this discipline among us that we're not taking anything. Then we took Jimzu. BE: Sha'alvim, today it's Sha'alvim. We went in that direction. We saw old people unable – those days were hot. 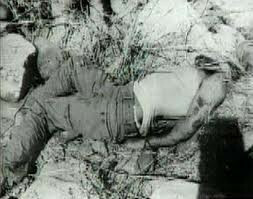 We saw were the bodies lay. We saw how next to the belongings, and the carts, bodies lay there, who couldn't make it. 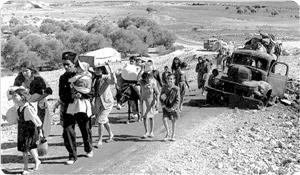 They fled towards Ramallah, the fled and the road was open, you see? BE: Two things. First, it was the first time we fought in daytime. I said, at night, whether you shot or didn't, whether you killed or didn't, you're not really sure. In Lod, you saw what you were doing. For the first time. When we were in the Negev, you know, Yiftach Brigade was a General Staff reserve unit. Wherever Yigal Allon went – that's where he took us. They fled to the mosque because they thought that was the safest place – that there they wouldn't kill them. Because they knew Israelis would not destroy a mosque. And it was talked about. Look, we were pulled out of Lod pretty quick. Because afterwards others came. This man came to us from Givati Brigade. 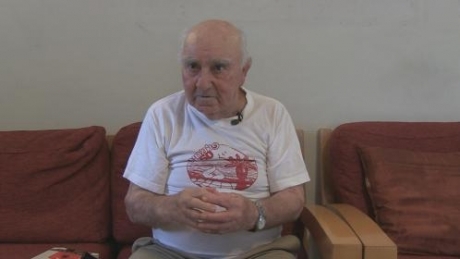 He was Givati's Propaganda Officer, and he told us: "I was ordered to take five radio receivers for Givati's clubs". I don't know whether he was or wasn't. There was a big argument there. I thing that in the end they let him – I didn't see it, whether he actually took or not. There was one from Rehovot, he had a print shop. I knew him, they wanted me to work in his print shop. But they came, and they started robbing. BE: No, I don't think it left me with a trauma. To a certain extent I'm sort of proud, that thanks to me and others like me the state was established. And you should know, already then there were defectors and thieves, and there were dishonest things. It started already then, so don't tell me that back then everyone was so righteous, that's simply not true. BE: There was a massacre there, but it depends what kind of massacre – not about that massacre. It's about that massacre that people keep talking about. I think all the time they keep talking about that massacre, the one that has to do with the mosque. The mosque massacre. Now who, if it were only those who were captured in the mosque – that was a massacre – or was there something else. And that is the question, that is what I'm not talking about, except for these people. BE: That's it! That's exactly what I had talked about there and that's why they called me from the Shabak (Israel Security Agency). That's how it went exactly, and it was voluntary, they asked who wanted to. They took all those who were cooks, all those who didn't go [to war]. They didn't force anyone. Whoever showed up showed up, that's it. Look here, let me tell you something. People in the Gaza Strip are set to hold the 45th anniversary of the Naksa Day, which marks the displacement of Palestinians from their homeland following the 1967 Six-Day war by Israel. Israel occupied the Gaza Strip, the West Bank and East al-Quds (Jerusalem), the Sinai Peninsula from Egypt, and the Golan Heights from Syria following the Six-Day war. Palestinians mark the Naksa Day (the day of the setback) on June 5. Israel has built a separation wall between the occupied West Bank and al-Quds (Jerusalem) and continues to build illegal settlements in the Palestinian territory. Israel denies about 1.7 million people in Gaza their basic rights, including the freedom of movement and the right to decent living, work, health and education. During the 1967 six-day war, Israeli forces launched an attack on Syria, Egypt, Jordan and the rest of the Palestinian territories of the West Bank and Gaza Strip, and occupied vast swathes of the Palestinian, Syrian and Egyptian territories. On the third day of the Israeli aggression, East Jerusalem al-Quds fell under occupation, and by June 10th Israel completed the occupation of Palestine, with its armies in control of the Syrian Golan Heights and the entire Sinai Pennisula. Palestinians have termed the day as the Naksa or the setback. We spoke to a Palestinian war veteran who said Palestinians were betrayed by Egyptian and the Jordanian forces on that day. He said Palestinian fighters on Naksa Daywere getting ready to liberate Palestinian land that was occupied in 1948. Israel still occupies the Syrian Golan Heights, the West Bank and Jerusalem al Quds. It withdrew from the Sinai peninsula in 1982 as part of the so-called Camp David peace accord with Egypt which was signed in 1979. Palestinian factions forced Israeli forces out of Gaza in 2005, but Israeli still maintains a de facto occupation of the tiny coastal sliver. Israel has built a separation wall between the West Bank and Jerusalem al-Quds and continues to build illegal settlements there. Experts say during 45 years of occupation, Israel has shattered Palestinian hopes to establish their own state. With Israel eating up Palestinian lands through a buffer zone in Gaza and settlement building in Jerusalem al-Quds and the west Bank, it remains to be seen if Palestinians will ever have a state of their own. Israel claims it no longer occupies Gaza ,but despite its withdrawal in 2005 Israel still imposes a blockade on the Gaza Strip and continues to control the air space, sea access and most of the entry points into the coastal enclave. The justice ministry in Gaza has said that Israeli occupation crimes against the Palestinian people were not subject to a time limit. The ministry said in a statement on Monday on the occasion of the 64th anniversary of Nakba that the Palestinian people were adamant on their rights and lands from where they were cruelly and forcibly evicted by illegal means that inflicted thousands of casualties and displaced hundreds of thousands from their homes. The ministry stressed that it would not spare any effort and would trek all means to bring the Israeli occupation leaders to trial. It denounced the international silence toward the Israeli crimes in violation of the international and humanitarian law. The ministry urged the Arab and Islamic countries, human rights groups, and free people of the world to stand alongside the Palestinian people until regaining all legitimate rights. The Arab political parties and popular committees in the 1948 occupied lands decided to form a committee to make outstanding preparations for the 64th anniversary of the Palestinian nakba. In a meeting held Tuesday morning in Umm Al-Fahm city, heads and representatives of the Arab parties and committees called on all Palestinians of the 1948 occupied lands to participate in the general strike to take place on the day of the nakba. The committee will prepare for several activities to commemorate the anniversary including cultural events, symposiums and photo galleries. The events will highlight the ethnic cleansing that happened to Lajon villagers who were displaced from their homes in that era and the central event will be held in this village. Buses, carrying Palestinians from different areas of the 1948 occupied lands, will be heading to the destroyed village of Lagon where they will take part in erecting tents on the ruins of the homes that were demolished by the Zionists in 1948. 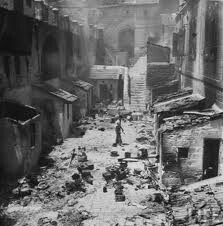 Nakba means "catastrophe" in Arabic. It refers to the destruction of whole Palestinian villages and towns in 1948 when more than 700, 000 Palestinians fled or were forced into exile and massacred by Israeli troops. Because the Palestinians were not Jewish, their presence and predominant ownership of the land were obstacles to the creation of a Jewish state. Their exodus, or Nakba, was already nearly half-complete by May 1948, when the Jews declared the establishment of their entity and the Arab states entered the fray.